We writers are expected to wear two hats, that of an introvert who retreats to her writing cave and excels in words, phrases, and commas; and that of an extrovert, a flamboyant artist who tells tales and binds an audience under her spell. And sometimes, we’re expected to wear both hats at the same time. This summer and fall, I couldn’t wear both hats and meet my publication deadline for the final book in the trilogy, “In Search of Adventure and Moments of Bliss.” Something had to go, and that something turned out to be this blog. My sincere apologies to my followers. My lowly gardening and pool hat and my expressive roaring twenties hat. I failed to wear both at the same time. Last Monday, The Long Way Back went on the press in Anaheim, and since then, I’ve donned my extrovert hat. I’ll be launching the book after it’s printed. My book designer, Alfred Williams of Multimedia Arts, and the owners and staff of LightSource Printing have been wonderful! I can’t wait to unveil the gripping conclusion to my nautical trilogy, “In Search of Adventure and Moments of Bliss.” Coming soon to Amazon and www.LoisJoyHofmann.com. It’s no surprise that I’m a lover of literature. I recently had a chance to answer some literary-related questions with Mikaela for her blog, A Place Like Me In A Girl Like This. One of my favorite questions was, “What book is your childhood sweetheart? Why?.” To read my answer and chime in with yours, click here. “Clear the decks,” the captain would bark when I was sailing around the world in our 43-foot yacht, Pacific Bliss. This expression originated in naval warfare of the 1800s, when it described how a crew would prepare for battle by removing or fastening down all loose objects on the ship’s decks. On our boat, our crew would scurry about, stowing any pans on the stove that could slide off, clearing anything personal from the galley and salon area so that all surfaces could be used for charts and navigation tools, fastening latches on the cupboards and lockers, and battening down the hatches. Now, as a landlubber, “clearing the decks” means “get ready for action.” I must finish dealing with what I am doing so that I can focus on something far more important. 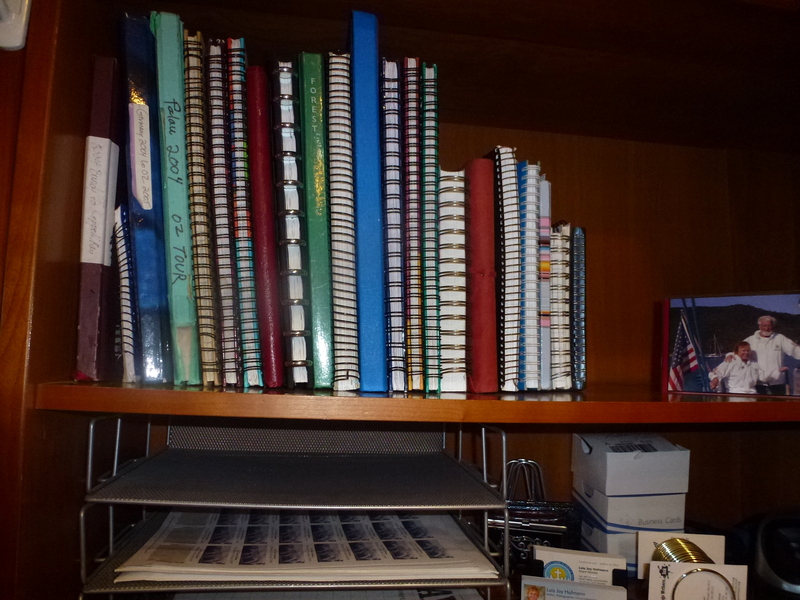 My priority for 2015 is to complete writing the trilogy “In Search of Adventure and Moments of Bliss.” But to accomplish that, I’d feel better with my research and files organized and easily accessible. That means getting my personal stuff and records (2014 tax files, etc.) out of the way and stowing the “history,” (the research and drafts of the already-published first two books in the series). Clearing my desk clears my head. Does that make sense? 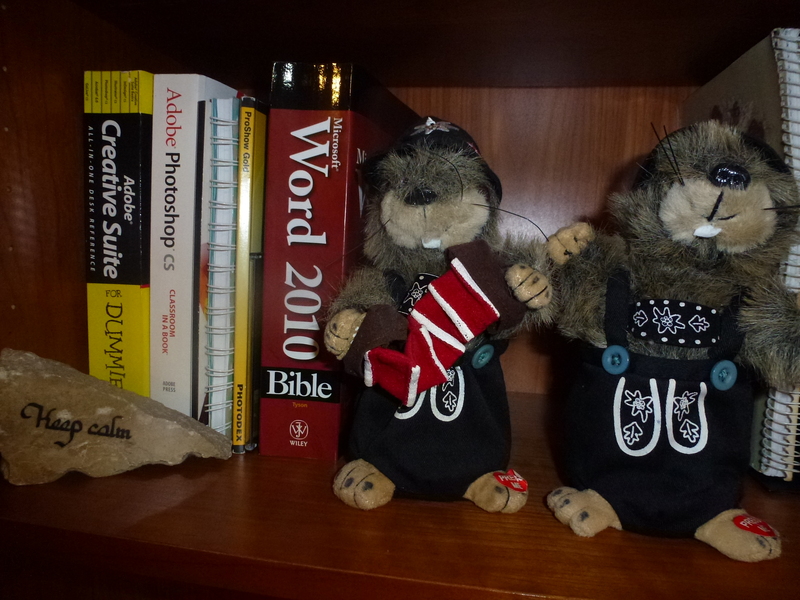 So I’ve swept the surface of my desk clean of extraneous stuff, put my journals and ship’s logbooks all in order (15 of them covering the last four years of our circumnavigation) and my two writing muses from the Austrian Alps are sitting on my reference shelf ready to encourage me by yodeling when I get stuck. I’m interested in hearing from my followers. What process do you use to begin the New Year or a new project? How do you clear the deck? It was rewarding to teach a workshop, “Author as Entrepreneur,” at the Southern California Writers Conference over Presidents’ Day Weekend. I enjoyed answering questions from writers during and after the workshop. After a packed day of general sessions, workshops, and one-on-ones, many attendees manage to brave the evening Rogue Read-and-Critique sessions that begin at 9:00 p.m. and often last until 2 a.m. I attended two “rogues” this year led by Matt Pallamary; they proved an excellent opportunity to read and obtain feedback on parts of the book I’m currently writing: The Long Way Back. As night falls, the real show begins. Ann is the first to hear the strange primal sound, accompanied by a swoosh, like surf rushing through a small opening in a rock cave. She calls us to the cockpit. “That must be a blowhole, over on the St. Bee’s side,” I tell her. “Whales!” We all shout. From then on we whisper, listening closely to the whale songs followed by the blow. Each stanza begins with a low moan, like an elephant, followed by a long screech that ranges from a low to a high frequency. The song changes to a long growl-like bark and ends with a monkey-like eee-ee, then the stanza repeats. 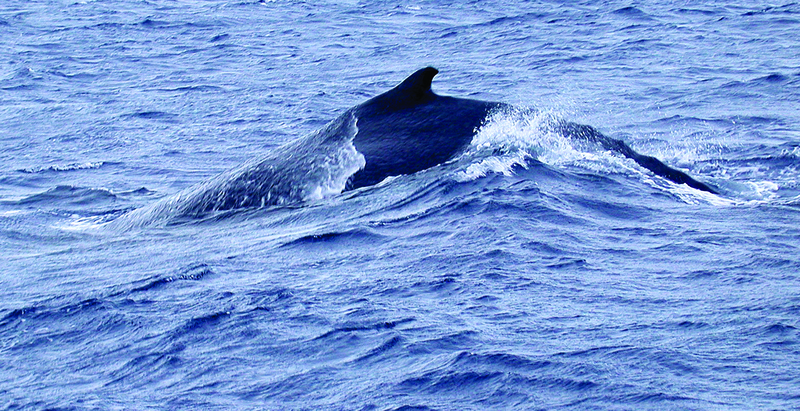 First, the haunting whale songs reach us from across the channel. Later, we hear them as the whales make their way south through the pass. We know that the plaintive sounds of the humpback can travel up to 20 miles underwater, but we’re so close that we can hear them from the cockpit. Above water. Magical! While we discuss the route of the humpbacks in hushed tones, the sky turns into a glittering canopy of stars, covering us with nature’s glory while grunts, groans, thwops, snorts, and barks continue. Finally, we hear the noises fade toward the center of the channel. The show is over. We turn into bed silently, tired yet awed. 0830: “Whales! I see them coming through the channel!” Günter calls from the bow of Pacific Bliss. He has just untangled the mooring line and Pacific Bliss is now swinging freely, her bow facing ESE toward St Bee’s hills. We all rush to the bow. Now—in the daylight—we can see the whales. 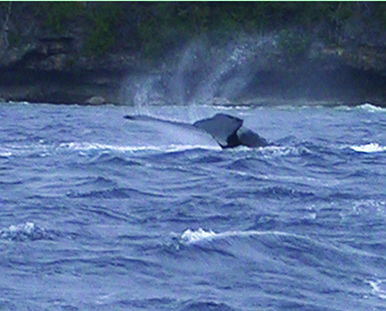 We watch, mesmerized, as two humped backs breach simultaneously. “Or fattening up from all that food on the reef,” Jimmy comments. We hear a few faint blows as the creatures swim out of range and on to the sea. Then nothing. That’s what I love about traveling the natural world: it whets my curiosity; it propels me to learn more. What a wonderful way to begin a new day! And what a whale of a day this is will be. 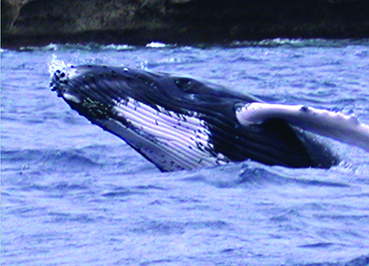 Some humpback whale songs are sung during the in mating and birthing season, but others are sung for other reasons. Researchers now believe that humpbacks learn from one another and sing for complex cultural reasons.